Germany is to reject a free trade deal between the European Union and Canada which is widely seen as a template for a bigger agreement with the United States, a leading German paper reported Saturday. Germany is to reject a multibillion-dollar free trade deal between the European Union and Canada which is widely seen as a template for a bigger agreement with the United States, a leading German paper reported on Saturday. Citing diplomats in Brussels, the Sueddeutsche Zeitung reported that Berlin objects to clauses outlining the legal protection offered to firms investing in the 28-member bloc. Critics say they could allow investors to stop or reverse laws. The German government could not sign the agreement with Canada "as it has been negotiated now," the paper reported, quoting German diplomats in Brussels. It also said that the clauses in the Canada deal were similar to those in the U.S. agreement, which is still under negotiation. "The free trade treaty with Canada is a test for the agreement with the United States," said one senior official at the Commission in Brussels, according to the paper. If the deal with Canada is rejected "then the one with the United States is also dead", added the official. Asked about the report, a spokesman for Germany's Economy Ministry referred to correspondence which outlined Germany's concerns about investor protection in talks with both countries. "The German government does not view as necessary stipulations on investor protection, including on arbitration cases between investors and the state with states that guarantee a resilient legal system and sufficient legal protection from independent national courts," Deputy Economy Minister Stefan Kapferer wrote in response to an inquiry from a Greens legislator. In the letter, dated June 26, Kapferer took a similar position on investor protection in the still-to-be-agreed Transatlantic Trade and Investment Partnership (TTIP) agreement with the United States. 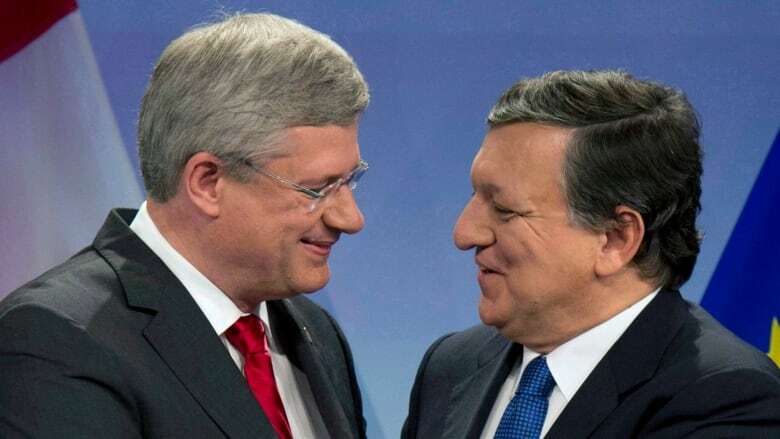 Brussels argues that without these clauses companies from Canada will not invest in Europe. The Sueddeutsche said that EU states will this week receive the treaty for officials to examine in detail before it is signed. All 28 members of the EU have to sign the agreement for it to take effect. The deal with Canada could increase bilateral trade by a fifth to 26 billion euros a year and the more ambitious one with the United States, if agreed, could encompass a third of world trade and almost half the global economy. Both accords seek to go far beyond tariff cuts and to reduce transatlantic barriers to business, but the talks are extremely complicated.